Q: How can I cut MP3 files online? Listening to the music is a pleasant thing. Sometimes when you hear a song that you like it very much, you may want to make it as your ringtone. In other cases, you may need to cut and remix several music files for a birthday party, etc. One of ways to solve this problem is to cut music files online, which is easy and free. 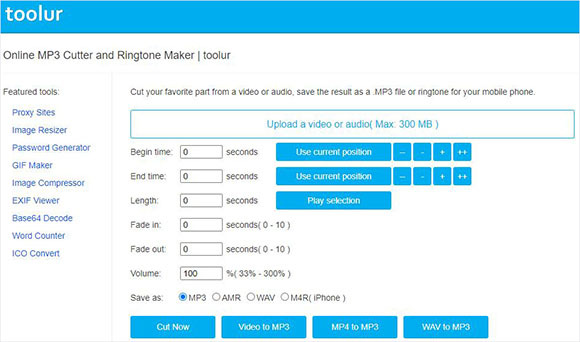 In this guide, we will give you simple steps on how to cut MP3 online in an efficient way. 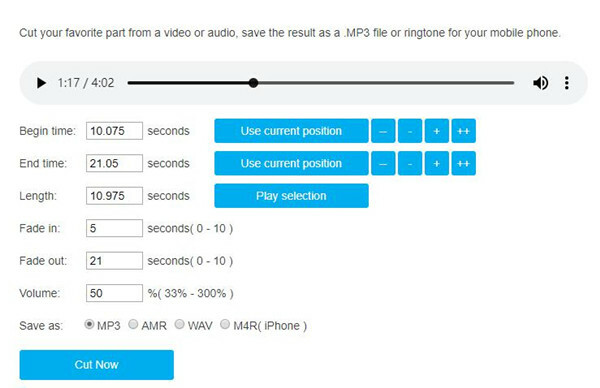 After open Toolur on your browser, you can simply click the "Upload a video or audio" button to import an MP3 file you want to cut. Please make sure that your music file is no less than 300MB. After your MP3 file is uploaded, it will be played automatically. There are two ways to determine the begin time and end time. One is to simply click the "Use current position" button when you pre-hear the song; the other is to enter the specific value for the start point and end point. After that, you can play the selection to see whether it is the part you want. Besides, this tool also allows you to set Fade in/out effects and adjust the volume of the file. Next, you can choose an output formats from MP3, AMR, WAV, M4R (for iPhone). When all settings are ready, now click the "Cut Now" button and wait a while until the cutting is done. Your split file will be saved to the local folder of your computer. Now click the "Download Now" button to get your new song. Cutting MP3 files online can be free and easy; however, its limitations and drawbacks are also obvious. As it's free, there are always some annoying ads showing up. Besides, it may not safe compared with desktop-based MP3 cutting tools. 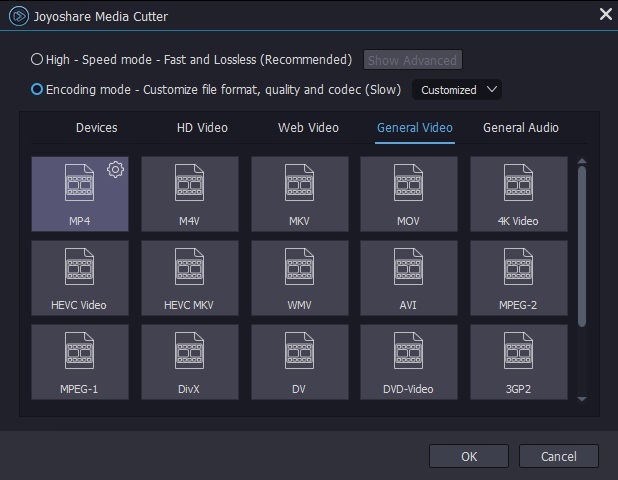 Therefore, here we'd like to recommend another effective way to trim MP3 files with Joyoshare Media Cutter. 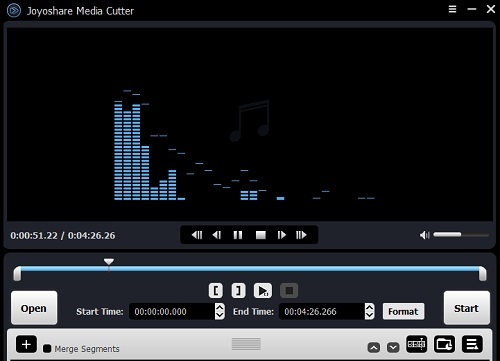 Joyoshare Media Cutter is not only a well-know video cutter, but also a useful MP3 cutter and joiner. It can be used to cut, trim, split MP3 files, merge the audio clips, remove unnecessary parts, etc. at a lightning fast speed without damaging the original quality. Besides, it supports tons of audio file formats including M4A, M4B, M4P, M4R, WMA, AAC, MP3, MP2, MPA, AC3, MKA, OGG, AIFF, WAV, APE, FLAC, RA, RAM, AA, AAX, etc. You can also export the polished audio file onto various portable devices such as iPhone, iPad, Samsung Galaxy, Xbox, smart TVs, etc. Launch Joyoshare Media Cutter first after installed it on your computer. Click the "Open" button to import the MP3 song that you'd like to cut. Alternatively, you can simply drag the file and drop it to the main interface of Joyoshare. You have two methods to set the cutting segments. First one is just to drag the yellow slider to decide the start time and end time. The other option is to enter the specific value for the temporal interval. Note: 1. 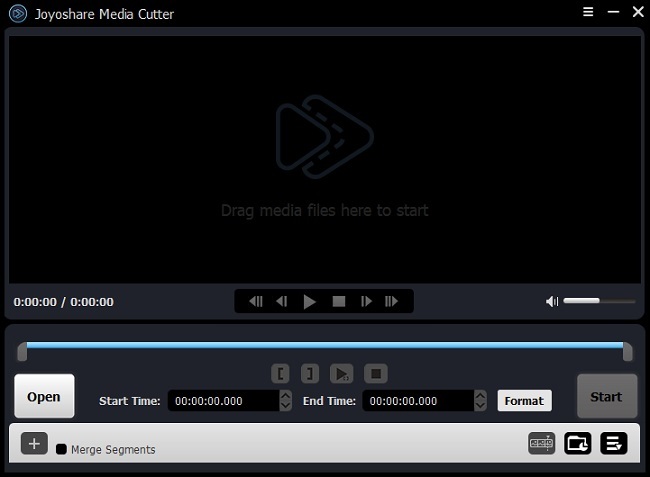 Click the "+" button to add more clips to cut and tick the "Merge Segments" box to join the audio clips together. 2. You can also click the Edit icon beside the file to edit the MP3 files if needed such as trim the audio, add special sound effects, etc. Next press on the "Format" panel and choose the first "High-speed mode" to cut MP3 file fast and losslessly. If you select the "Encoding mode", the quality may be lossy but you can customize output formats, codecs, bit rate, etc. Then click the "Start" button to trim your MP3 file. Wait for several second, you can find your new file from the destination folder .